The striker scored 28 goals in 46 games for United last season. The Swedish striker spent just one year at Old Trafford. 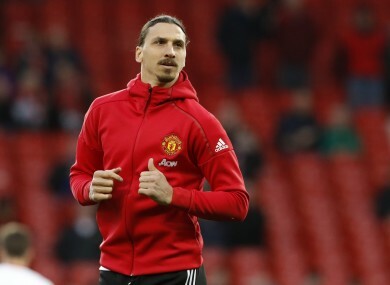 MANCHESTER UNITED HAVE not offered Zlatan Ibrahimovic a new contract and the Swedish striker was this afternoon among the list of players released by Premier League clubs. The 35-year-old is undergoing rehabilitation after a season-ending knee ligament injury and with his recovery expected to continue for a number of months, United have decided against triggering the option in his contract for a second season. Ibrahimovic played 46 games under Jose Mourinho during the 2016/17 season, scoring 28 goals, but injury ruled him out of the final 10 matches of the season, including the Europa League final win against his former club Ajax in Stockholm. United are understood to have already begun their search for a replacement with Alvaro Morata reportedly set to join the Red Devils. The 24-year-old is willing to leave Real Madrid after failing to cement a regular place in the starting XI at the Bernabeu with United and AC Milan now battling it out for his signature. As for Ibrahimovic, his agent Mino Raiola has suggested that the Swede is keen to remain in the Premier League, opening the door to the former Barcelona man to join one of United’s rivals. Email “Zlatan Ibrahimovic is looking for a new club after Man United release confirmed ”. Feedback on “Zlatan Ibrahimovic is looking for a new club after Man United release confirmed ”.